The latest installment in the Directed Reading series concerns titles that treat the topic of health with regard to questions of law, ethics, and justice. This subject matter is of much wider scope than that of "health care," which receives the bulk of attention in both academic and policy-making worlds. These titles should should be of particular interest to those from the fields of medicine, medical ethics, bioethics, public health law and ethics, epidemiology, health law, psychiatry and psychology (including the 'philosophy of...'), and (last but not least) medical humanities. The material below is meant to motivate both the novice in, and seasoned reasearcher from, the aforementioned fields of health theory and praxis to widen their horizons...or at least deepen their acquaintance with the current literature. For a sophisticated introduction to much of the subject matter broached in our bibliography, please see the recent entry on "Justice, Inequality, and Health" in the Stanford Encyclopedia of Philosophy (SEP) by Gopal Sreenivasan. Inequalities in health are...closely tied to inequalities in the most basic freedoms and opportunities that people enjoy. We have known for over 150 years that an individual's life and death are patterned according to social class: the more affluent and better educated people are, the longer and healthier their lives. These patterns persist--even when there is universal access to health care--a finding quite surprising to those who think financial access to medical services is the primary determinant of health status. In fact, recent cross-national evidence suggests that the greater the degree of socio-economic inequality that exists within a society, the steeper the gradient of health inequality. As a result, middle-income groups in a more unequal society will have worse health than comparable or even poorer groups in a society with greater equality. 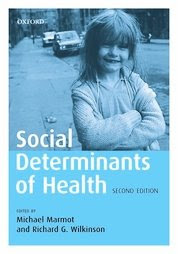 Of course, we cannot infer causation from correlation, but there are plausible hypotheses about pathways which link social inequalities to health and, even if more work needs to be done to clarify the exact mechanisms, it is not unreasonable to talk here about the social 'determinants' of health. If we have obligations of social justice to provide equality of opportunity, as in Rawls's robust notion of fair equality of opportunity, then we have social obligations to promote normal functioning [i.e., to prevent significant mental or physical pathology] and to distribute it equitably within society by designing our institutions properly. The broad determinants of health and its distribution in a population include income and wealth, education, political participation, the distribution of rights and powers, and opportunity. These are quite centrally the goods that any general theory of social justice is concerned about. We cannot achieve effective promotion of health in a society as well as its fair distribution without a just distribution of these other goods. Putting together the key results from the epidemiology literature with Rawls's principles of justice as fairness, we learn why justice is good for our health and we get a general answer to the question "When is a health inequality unjust?" Many kinds of social institutions can substantially contribute to the incidence of medical conditions. Of these, economic institutions--the basic rules governing ownership, production, use, and exchange of natural resources, goods, and services--have the greatest impact on health. This impact is mediated, for the most part, through poverty. By avoidably producing severe poverty, economic institutions substantially contribute to the incidence of many medical conditions. Persons materially involved in upholding such institutions are then materially involved in the causation of such medical conditions. In our world, poverty is highly relevant to human health. In fact, poverty is far and away the most important factor in explaining health deficits. Because they are poor, 815 million persons are undernourished. 1,100 million lack access to safe drinking water. 2, 400 million lack access to basic sanitation, more than 880 million lack access to health services, and approximately 1,000 million have no adequate shelter. Because of poverty, "two out of five children in the developing world are stunted, one in three is underweight and one in ten is wasted." [....] One-third of all human deaths are due to poverty-related causes. [T]he most plausible ethical framework for considering the claims of vulnerable populations in health resource prioritization is that of priority for worse-off groups. In the United States...black men in deprived areas have twenty years' shorter life expectancy than richer white men. The major contributors to this excess mortality are violent deaths, HIV/AIDS, and cardiovascular disease. Poverty of material conditions does not provide a ready biological explanation for the causes of shortened lives. [....] In so far as material deprivation can be seen to cause homicide or risky sexual behavior or drug use, its effects are likely to be through psychological pathways. To be clear, we have had pathways linking material circumstances to disease via exposure to cold, infections, malnutrition. More recently, these have been supplemented by behaviours such as smoking, diet, and physical activity. The psychosocial approach emphasizes subjective experience and emotions that produce acute and chronic stress which, in turn, affect biology and, hence, mental and physical illness. Our growing understanding of psychological factors points to ways that the social environment can have a powerful influence on health. All three types of pathways--material, behavioral, and psychosocial--should be within our focus. A moral viewpoint that puts great store on individual choice and responsibility must offer a criterion for determining which choices incur these obligations. The web of complications that stand in the way is, as we know from criminal law, extremely broad. But in criminal law we have at least a set of precedents and statutory specifications that guide us. In the case of personal responsibility for health, we have only the intuitions of one observer, set against that of another. Moreover, actions only rarely have all the attributes--informed, voluntary, uncoerced, spontaneous, deliberated, etc.--that, in the ideal case, are conditions for full personal responsibility. This is a particular problem in the case of lifestyles, which are matters of habit ingrained over many years and may have been learned from the individual's principal role models. An examination of the small literature...that has proposed a greater role for personal responsibility reveals that not all choices leading to illness are counted alike. Those that are targeted tend to be sins--sloth, gluttony, lust, to use their old-fashioned names--or to be behavior, such as drug addiction, of the marginalised. [A] policy in which individuals are made to shoulder the burden caused by adverse consequences of choices they have made must make "the punishment fit the crime." The burden re-imposed on the risk-taker should be proportional to the burden imposed by the risk taking. But there is no metric to permit this. One problem is that similar behavior in different people, and in different circumstances, represents quite different levels of risk (Japanese men, for example, are less likely to contract lung cancer from smoking than American men). Moreover, some habits which are unhealthy, even lethal for some are actually health-giving to others; alcohol is the outstanding example. And some habits, because they are taxed, may present a net economic gain to their societies. [....] In this light, proposals to attach importance in health policy to imprudent health-related behavior involve a great deal of hand-waving. A sense of proportion is elusive. [T]he fostering of a sense of personal responsibility for health can be part of a programmes of "positive freedom" or "empowerment," a realization that actions taken can have a marked and positive impact on one's health, with radiating good effects on other dimensions of life and on other people. There is a risk, in stressing what the individual can do to stay healthy, that an individual's actual power will be exaggerated, and consequently that people can come to blame themselves, wrongfully, when they fall ill. But there is nothing inherent in the prospect of health promotion that necessitates this double message, and there is no reason to hold back from development of techniques of education and motivation which enable those who would favour the tradeoffs required to avoid illness and injury to do so efficiently and confidently. Neither self-blame nor that of others need figure in personal responsibility for health thus conceived. The basic assumption of the diagnostic framework [of psychiatry] is that the presence of enough particular symptoms, regardless of their cause, indicates an underlying disease. This assumption is especially problematic when psychological and psychosomatic symptoms are products of taxing social environments. People who become depressed and anxious or who develop psychophysiological symptoms when they struggle with stressful life events, difficulties in interpersonal relationships, uncertain futures, bad jobs, and limited resources, react in appropriate ways to their environments; they do not have internal dysfunctions and so are not mentally disordered if their symptoms disappear when their social circumstances change. The failure to adequately separate naturally designed sadness responses from internal dysfunctions misconstrues as a mental disorder a basic and universal aspect of the human condition and thus inappropriately pathologizes a tremendous range of human behavior, underming the credibility of psychiatry. One consequence of the recent "biological" turn is that psychiatrists increasingly fail to appreciate the dynamic of their relationships with their patients. There is a growing split between pharmacotherapy and psychotherapy that is most evident in North American psychiatry. Actual time with patient is shrinking rapidly. Psychiatrists now commonly prescribe medications after only a brief encounter with the patient, and with only occasional follow-ups. There is an almost complete reliance on RCTs [randomized controlled trials], which owes something to the perception that going by evidence other than RCT evidence is just not scientific--that's what we used to do back in the bad old days. Prescribing antidepressants has become as antiseptic a therapeutic encounter as giving an antibiotic. [T]o the extent that American bioethics has principles, they are mostly drawn from American law, including liberty (autonomy) and justice. Both the genetics and bioethics communities have consistently underestimated the power of market forces and commercialism to shape the demand for and use of new reproductive technologies. Medicine has become a business, and business ethics have eclipsed medical ethics. A perennial problem seems to be the American temperament, which is much more comfortable in fashioning health policy, or any kind of policy, using the language of management techniques and economic efficiency, of money and incentives, and of practical matters of making policies work, than with the articulation of clear health-care goals. Medical ethics reasoning has made only a modest mark on the law of health care provision in the managed care era and judicial decisions routinely depart from prevailing medical ethics understandings. The ideals of market-driven efficiency, regard for personal autonomy, and professional benevolence make recurring appearances in health care case law...as policies and values embedded in statutory schemes and common law. There is little evidence that either traditional professional ethics or contemporary bioethics have heavily influenced judicial decisions concerning health-care organization, financing, and provision. The medical act has become a commodity to be bought and sold in a highly competitive managed care marketplace. Medicine is fundamentally a moral enterprise because it is devoted to the welfare of the persons it treats. Medicine is also primarily therapeutic, a matter of helping those who cannot help themselves and who are thereby critically vulnerable. Because of this, it is not at its roots a system of knowledge except as that knowledge advances therapy. Science and morality are not opposed--they are joined in medicine. Science cannot be the dominant force in medicine because it is in the service of something larger than itself. Even before the storm, they were some of the country's neediest kids. Now, the children of Katrina who stayed longest in ramshackle government trailer parks in Baton Rouge are "the sickest I have ever seen in the U.S.," says Irwin Redlener, president of the Children's Health Fund and a professor at Columbia University's Mailman School of Public Health. According to a new report by CHF and Mailman focusing on 261 displaced children, the well-being of the poorest Katrina kids has "declined to an alarming level" since the hurricane. Forty-one percent are anemic—twice the rate found in children in New York City homeless shelters, and more than twice the CDC's record rate for high-risk minorities. More than half the kids have mental-health problems. And 42 percent have respiratory infections and disorders that may be linked to formaldehyde and crowding in the trailers, the last of which FEMA finally closed in May. The "unending bureaucratic haggling" at federal and state levels over how to provide services and rebuild health centers for the Gulf's poor has made a bad situation much worse, says Redlener: "As awful as the initial response to Katrina looked on television, it's been dwarfed by the ineptitude and disorganization of the recovery." Some kids may end up with permanent developmental and cognitive delays, but many can still be helped. The first step will be finding them. FEMA was supposed to provide Louisiana with contact information for the families that moved out of the trailers; it has not done so. The agency's case-management program also "has yet to provide any services for thousands of families," according to the report, and funding for the program expires in March.